The book features 13 American women who "helped shape our country." "She was warned. She was given an explanation. Nevertheless, she persisted," Sen. Mitch McConnell said. Those words describing Sen. Elizabeth Warren's formal silencing in the Senate are now the title of a new book. It's written by none other than Chelsea Clinton. Last month, the U.S. Senate formally silenced Warren. The Massachusetts senator had been reading a decades-old letter by Coretta Scott King as part of her opposition to Sen. Jeff Sessions' nomination for attorney general. She was silenced for apparently violating a rule that bars senators from criticizing colleagues. The Senate majority leader's "nevertheless, she persisted" line kind of backfired. It became a trending hashtag on Twitter and was turned into merchandise. And now, it's a book. According to the book's description, it tells the stories of 13 American women who — you guessed it — "persisted" and "helped shape our country." Some of the women featured are Harriet Tubman, Sally Ride and Sonia Sotomayor. Clinton's mother — former secretary of state and Democratic presidential nominee Hillary Clinton — isn't listed as one of the 13 women featured in the book. But another woman makes "a cameo." We're wondering who that could be. 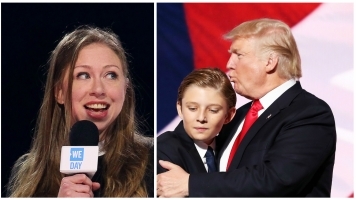 Chelsea Clinton previously released a children's book in 2015. The book — "It's Your World: Get Informed, Get Inspired & Get Going!" — tells the stories of young people who have done their part to help change the world. "She Persisted" will be released May 30.